Choosing the right roof for your home is a process that takes time and effort. At Live Oak Construction we specialize in shingle roofing and flat roof construction, as well as the repair of any roofing problem. Working with the nation’s top roofing materials manufacturers, we offer a wide variety of Houston residential roofing and commercial roofing Houston choices. Two of the most popular roofing styles installed by Houston roofers are asphalt shingle roofs and flat roofs. Asphalt shingles are the most popular choice for roof coverings in America. The positive aspects of asphalt shingles include low installation and maintenance costs. Roofs made out of these shingles come in different grades. The better the grade, the longer the life expectancy, which can range from 15 to more than 30 years. An additional advantage of asphalt shingles is that in certain circumstances, they can be installed over an existing roof of asphalt shingles, eliminating the need to remove the old roof. One of history’s oldest roofing materials, modern slate roof panels (such as GAF’s TruSlate™) are modified to be lighter and more affordable, while still delivering the elegant look and long life of a slate roof. 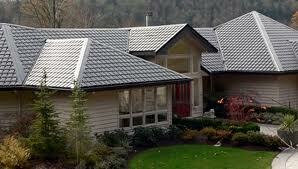 Metal roofing is fast becoming a preferred material across the country. New alloys and coatings make metal roofing panels more durable, with extended lifecycles that can exceed shingles or shakes. Plus metal roofs can be architecturally dramatic and colorful. In contrast to the sloped form of a roof, a flat roof is horizontal or nearly horizontal. Materials that cover flat roofs must allow the water to run off freely, protecting your home from water damage. Although flat roofs are more common on commercial buildings, many modern residential homes feature flat or “low slope” roofs or have flat roof sections. Addressing the roofing needs of a flat roof is a highly specialized area, as drainage and coverage issues must be properly addressed. Live Oak Construction can install or repair single ply membrane roofs or built-up roofs on a flat or low slope surface. No matter what type of roof you have, our Houston roofing experts specialize in waterproofing and leak repairs. Contact us today and set up a free in-home consultation on your next Houston roofing project.